A Tarot reading measures potential outcomes and evaluates influences surrounding a person, an event, or both. The Tarot reading helps you become more aware & helps you make more informed choices in your life. 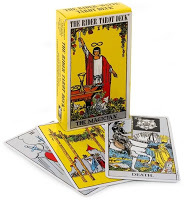 Tarot cards are a divination 'tool' used to facilitate insight into a particular question or problem. A session begins with you shuffling the cards while focusing on the question or situation. As a result, your energy is imprinted onto the cards. The cards that come up in a reading are therefore 'your' cards. Cards have different meanings on their own as well meanings dependent upon the cards surrounding them in a reading. Archetypal information from the cards is combined with intuitive interpretation to convey the 'meaning' of the spread in a session.to create a personalized. A few people are still 'afraid' of tarot cards. It is important to remember that the cards themselves have no power. They are simply messengers with information. The information that comes up in a reading is specific for you. The power and energy in the reading comes from you. The card 'reader' is a just a medium to help deliver the message that they bring. They are intended to enlighten and inform...not scare or intimidate. A card reading is often a very insightful and healing experience. Want To Learn Tarot? ~ We Teach It! Book a party with a group of 6 or more and Receive a FREE Reading!